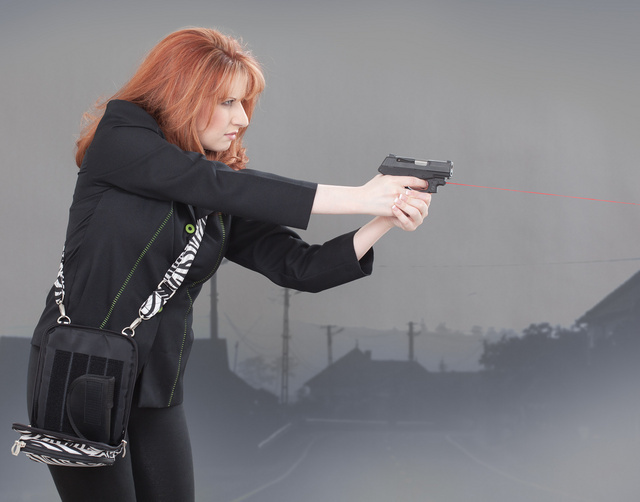 This entry was posted in hoster, light/laser, self-defense, weapon and tagged keltec, purse. Bookmark the permalink. yeah, definitely not my style. glad to see other folks doing holster purses, though. When carrying concealed, you need a way to not only get your gun into action quickly, but QUIETLY. Never pick one which closes with Velcro (like the old Gunny Sacks), and if it has a tear-open zipper, that has to be SILENT. Nothing will attract the attention of the bad guy faster than either Velcro opening or a loud zipper zipping, and in that time, YOU are not yet in action, so baddie has the drop on you. i’m a HUGE HUGE HUGE fan of EvylRobot’s offering. i’m sure that he would have put a zippered compartment in the side, had i asked for it…as it is, the flap is VERY quiet. if i were to draw, it would be completely silent – i’ve tested it with a dummy at home. Seems like a magnetic seal would be a good choice for an application like this. It should be completely silent to open. The holster be damned (good, bad or indifferent – I don’t care)… Either someone taught this woman proper gun handling, or she is brilliant! How rare it is to see a woman shooting that is not leaning backwards AND has the correct foot forward for her handedness. Grip is perfect too. Were it not for the laser, I’d have her bring the gun up a little higher (to use the sights) but over-all? A++ for posture, stance and grip! I’m in LUV!